The Italian photographer, Massimiliano Fusari, noted for his work on Middle Eastern themes, recently spent several months in the Tentmakers Suq (bazaar) in Cairo. He has produced a vivid and sensitive photographic record of the daily work and physical environment of the tentmakers. Arresting images capture the tentmakers at work as stitchers and sellers, the medieval street on which they work and its larger changing neighbourhood, and the uses of the textiles in Cairene life. Massimiliano Fusari is a photojournalist and multimedia consultant currently working as a Research Associate at Durham University. He has a background of more than 20 years as a researcher and practitioner in the theory and practice of photography and multimedia communication, with expertise on the Muslim world. His PhD research focuses on how to prioritise distinct media platforms to reach diverse audiences and maximise public impact in multi-cultural communication. ‘Massimedia’ (http://www.massimedia.com) is his laboratory, providing media consultancy on photojournalism and multi-audience projects. "The Tentmakers of Cairo Exhibit - Stitch Like An Eqyptian" had 95 quilts displayed and two of the artists were on site actually doing their applique stitching. &nbsp;Men are usually the artists, working by themselves or in tentmaker shops. &nbsp;The designs are often geometric and revolve outward around a center. The patterns are taken from medieval Mosque floors and other decorations, scenes found in tombs of the Pharaos and antique calligraphy. &nbsp;Originally these hangings were meant to decorate interior tent walls. &nbsp;A plain canvas backing and multiple layers of applique on a colored cotton background add to the weight of each piece. 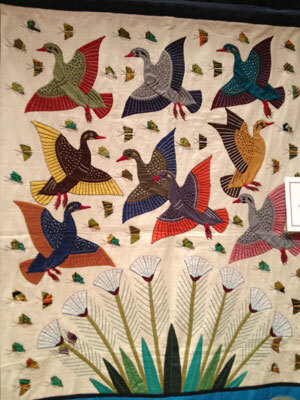 Another well presented Exhibit during AQS QuiltWeek/ Phoenix was Stitch Like An Egyptian with The Tentmakers of Cairo. The American Quilter’s Society is pleased to present the debut of Stitch Like an Egyptian at AQS QuiltWeek® – Phoenix, Arizona 2014 from February 5 to 8, 2014. Counted among the most celebrated fiber artists of this decade, the Tentmakers of Cairo return to the United States with 130 pieces of appliqué artistry. Each piece is handmade in Cairo, Egypt, specifically for exhibition in the United States and will be available for purchase at the event. 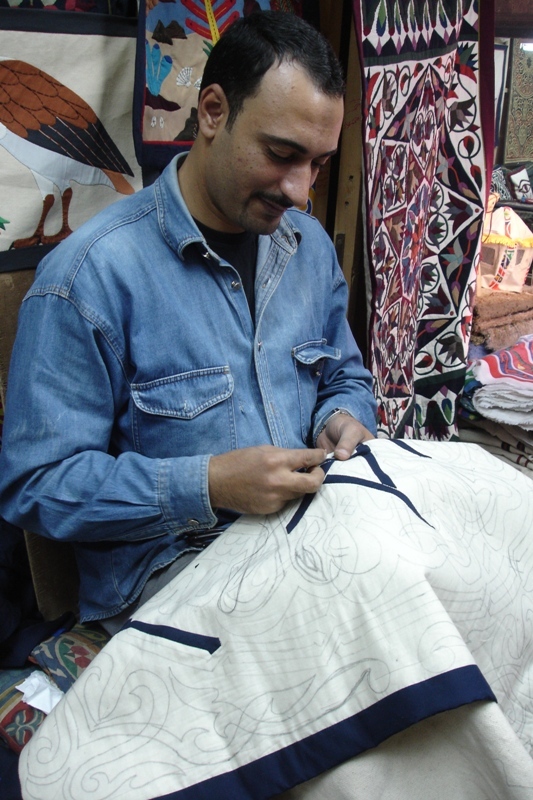 Tentmakers of Egypt—an art form strives to survive. Back in 1976, when I first arrived, many of Cairo’s festivities were liberally decorated with tent hangings. These enormous appliqués—with their bold colours and geometric designs—were used to create the walls and ceilings of celebratory spaces. Master quilter brings wares to Egyptian Embassy for open day. The ancient craft of Egyptian tent-making maybe revered in the West for its intricate applique, but in Egypt, its considered simple, common, and often no better than graffiti. 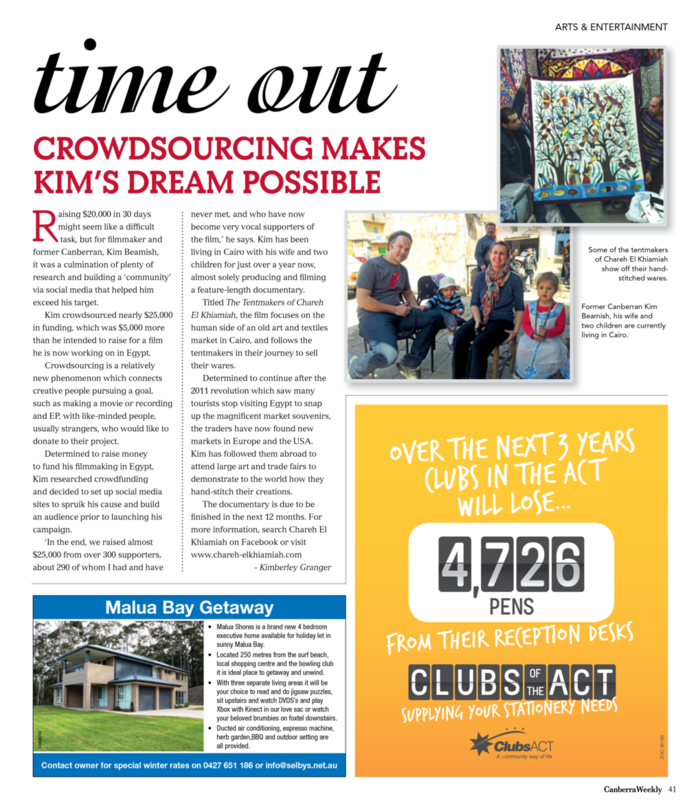 But a master quilter and wife of former Australian ambassador to Egypt is on a one-woman crusade to change all that. Jenny Bowker, who spent four years in Cairo when her husband Bob was posted there between 2005-2009, said the appetite for the massive handmade artworks was growing internationally. Cairo's Khayamiya Not Yet History, But For How Long? 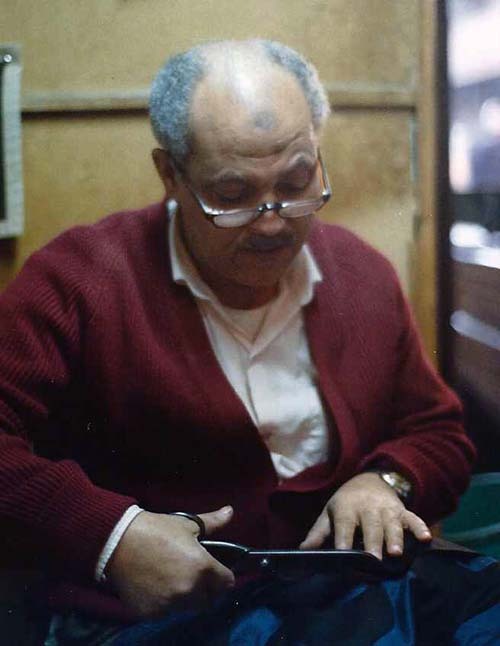 I recently found out Amm (Uncle) Salah, Cairo's famous tentmaker artisan, died some years ago, and that his daughter Mona carried on the tradition privately from her home until she moved away to Abu Dhabi. It gave me a sinking feeling that another handicraft in Egypt was biting the dust due to unrest in the country, a suffering tourism industry, and decades-long competition from the Indian subcontinent. Some of the Tentmakers of Cairo with Jenny Bowker & Bonnie Browning. May 2012. Did you know that the American Quilter’s Society is the exclusive U.S. representative for sales of the works of all 18 shops known as The Tentmakers of Cairo? For the next three years, AQS has guaranteed a steady stream of work & orders to exhibit and sell the art in the United States. Never in the history of this type of artwork have the stitchers & designers known that they have a steady stream of income! 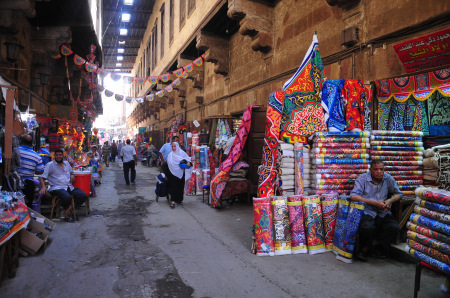 A new documentary by Australian filmmaker Kim Beamish shines a light on Al-Khiamiah, a street in Downtown Cairo filled with all types of textiles. Al-Khiamiah, or ‘tentmakers’, specialises in the type of fabric from which traditional tents are made. Mr T has this piece of appliqué on the back of the study door for over 20 years!! My husband acquired it when he was helping clear out a props cupboard at the school where he was teaching and rescued it from the bin. He was told it had been used in a school play many years before that, and presumed one of the teachers had made it. We rather liked it and hung it on the door, which is where it has stayed. As the door is usually open, I must say I don't notice it any more. 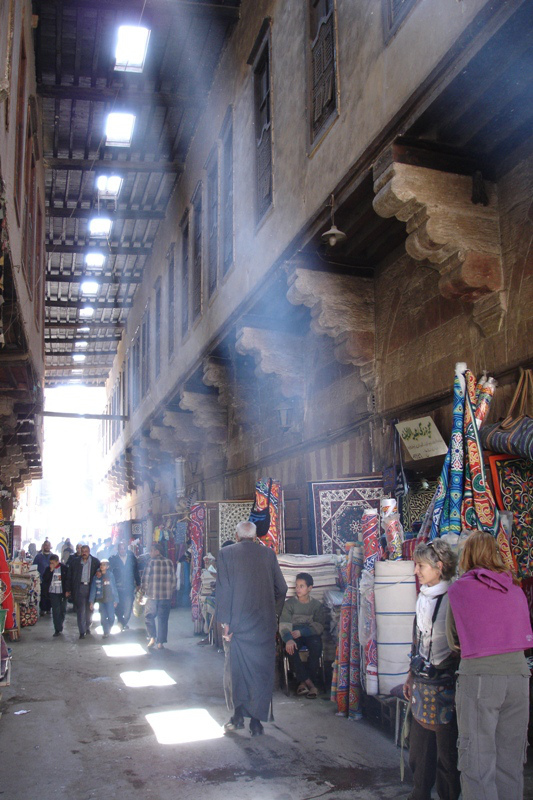 "... Khan el-Khalili is just a springboard for wandering deeper into Islamic Cairo. (That's "Islamic" as opposed to the more European-feeling, French- and British-designed streets that make up the modern downtown.) 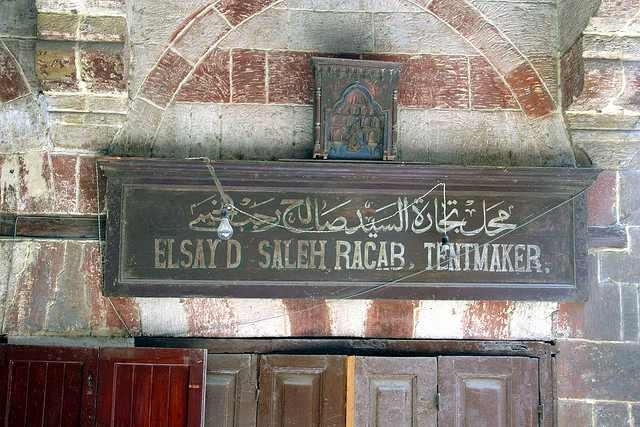 My favorite areas to explore were along Souk el-Selah street, the "Street of the Tentmakers" (Chareh el-Khiamiah), and the gate named Bab Zuela." 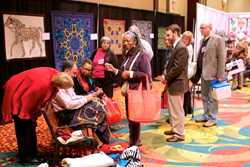 Tens of thousands of visitors will be in our region to view the contemporary art of quilting in a myriad of styles, methods, and materials during the AQS Quilt Show and Contest in Paducah the 24th through the 27th of April. Among these visitors will be two men from Cairo, Egypt who will be demonstrating their art of applique’, making works on the spot, exhibiting their textile art and selling works as well. Next we meet the woman who paved the way for these artisans to have access to the American marketplace. Kate Lochte interviews Jenny Bowker. 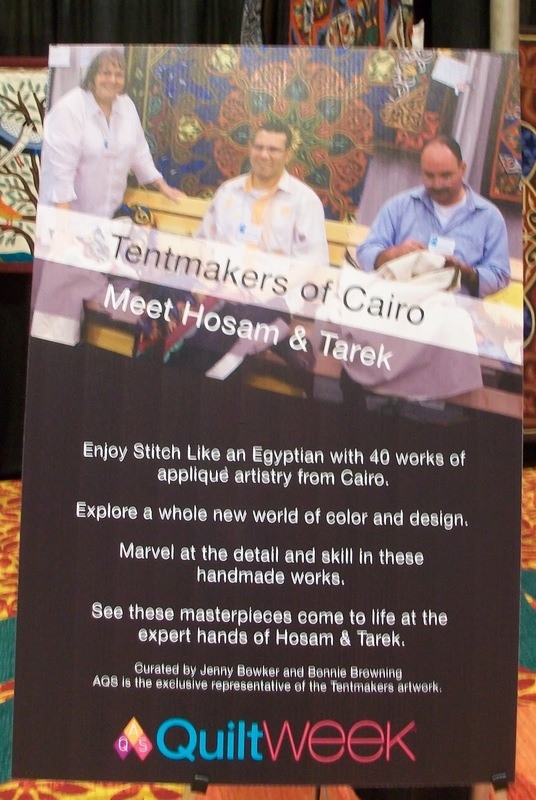 One of the highlights for me was the exhibit by the Tentmakers of Cairo. The AQS debuted 40 new works commissioned specifically for this event and handcrafted by the men of the Chareh El – Khiamia(Market of the Tentmakers) in Cairo, Egypt. The highlight of the show for me was an exhibit by the Tentmakers of Cairo. The applique are needle turned and made with a very large needle and pair of scissors with a very stabbing motion following a chalked line. Only men make these quilts and they make them only for their families. The backing is a piece of canvas. They were for sale at the show. It seems as if months have passed since I was in Cairo, although it really is only a few weeks. In that time the crowd-funding appeal for the documentary film on the work of the Tentmakers has reached its goal and they have been featured at quilt shows in France, the US and one to come here in the UK. You can imagine that I’m mega excited about the UK show - British Quilt & Stitch Village – because it is virtually our local show, less than 20 miles away. It will be very strange meeting up with Hany in my country rather than his. Hany is one of the first Tentmakers I met and chatted to on my first visit to the Street of the Tentmakers in 2002 and I have several pieces of his work in The Cupboard my collection. The quilters who likely traveled the farthest to get to the show are Hosam Hanafy and Tarek Abdelhay, two traditional tentmakers from Cairo. Several of their appliqué wall-hangings are displayed in the Heritage Ballroom, on the convention center's third level. They also will be doing demonstrations of their craft during the show. 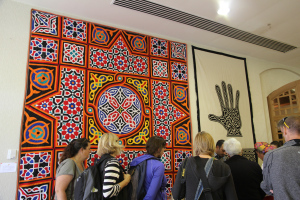 Kim Beamish, Producer of 'The Tentmakers of Chareh El Khiamiah' has raised $25,000 via an international audience of quilters, textile artists and those interested in independent documentary and a film about Egypt away from the square. An Australian Filmmaker residing in Cairo, Egypt has successfully raised nearly $25000 through the Australian crowd funding website Pozible.com and in doing so has joined a growing number of independent documentary producers turning the industry's traditional marketing model upside down. Kim Beamish has already sold hundreds of DVDs of his latest project, a documentary about traditional textile workers suffering the effects of post revolutionary Egypt, yet he is only halfway through shooting his film with an expected release date more than a year away. With more than a quarter of the fund raising campaign left Beamish’s documentary film, The Tentmakers of Chareh El Khiamiah, had already brought on board more than 200 supporters from around the globe. With the majority of supporters coming from the worldwide quilting and textiles community whose interest in international textiles and fabrics is almost insatiable. The trailer, which over the 30 days of the campaign was watch almost 2500 times, is a three and a half minute portrait of Hosam El Farouk that introduces the audience to Hosam’s family, his life and the work of Chareh El Khiamiah, the Tentmakers Street, in Old Islamic Cairo. With the final film still more than a year away it is hard to judge its success and there is still a long way to go in building support and raising funds. There are many crowd funding websites out there that people can use to market their creative projects and financing goals. With projects wide and varied in what they want to achieve, from transporting cats from Beirut to computer games and cook books. Each with a pitch, a goal, a deadline and the hope that when the time is up the goal is met. The Tentmakers of Chareh El Khiamiah supporters will over the next 30 days receive rewards for their pledges ranging from a Thank You in the final films credits, to DVD’s with hand stitched covers, T-shirts and cushion covers stitched by the Tentmakers of Cairo themselves. 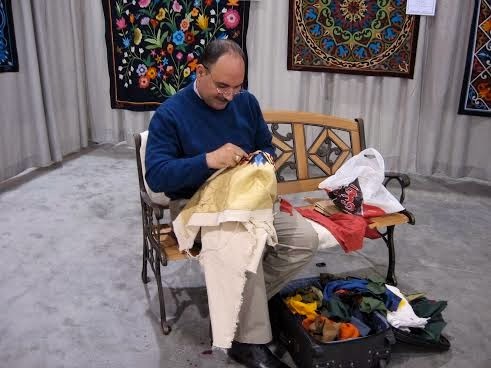 All of the funds raised through the campaign will go towards travel costs between Egypt and the USA, as the Tentmakers exhibit their work and skills in some of the worlds largest quilting and textiles shows. As well as translation costs and the hire of an Egyptian film editor. Beamish hopes that editing will start at the end of July this year with a possible release halfway through next year. Just putting the final things together to leave for Cairo with enough time to post an important link and appeal ….